Abu Dhabi, UAE. Sofitel Abu Dhabi Corniche that operates under AccorHotels, was named as the Leading Business Hotel 2016 by prestigious World Travel Awards. “We are proud to receive our fifth trophy. It is fantastic to see that our team was recognized by prestigious World Travel Awards. This became possible due to hard work of our Ambassadors” said Mr. El- Wary, General Manager of Sofitel Abu Dhabi Corniche. “We are passionate about service from the heart and world-class hospitality. Every day we work to provide warm welcome, attention to details as well as create magnifique moments to our guests. Also we aim to consistently provide innovative services and new products,” stated Mr. El-Wary. 23rd World Travel Awards gala ceremony was conducted on 29 September 2016 at St Regis Dubai hotel. The Awards was established in 1993 to acknowledge, reward and celebrate excellence across all sectors of the tourism industry. 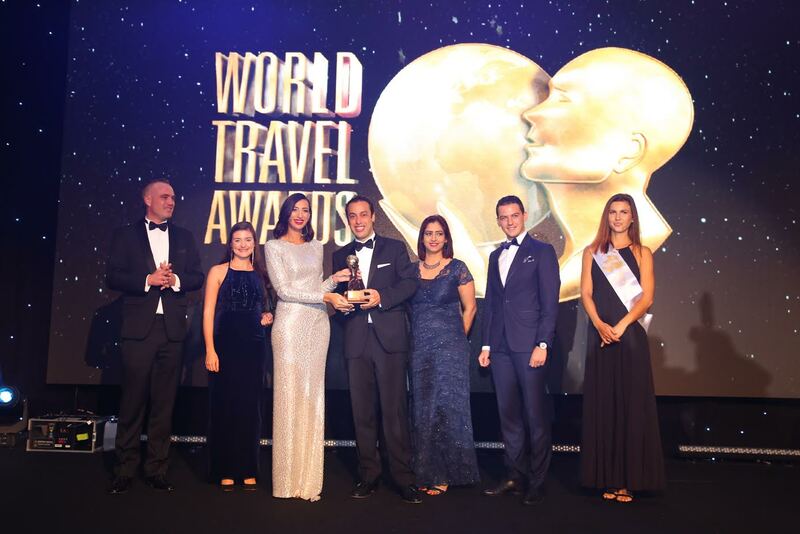 Today, the World Travel Awards brand is recognized globally as the ultimate hallmark of quality, with winners setting the benchmark to which all others aspire. Located at the eastern tip of Abu Dhabi’s Corniche road, the hotel is within walking distance of the seafront and close to the business district. Being part of the Capital Plaza Complex, all 280 hotel’s rooms and suites offer breath-taking views of the Corniche. Inspire your events in opulent setting at Crystal ballroom or one of 8 meeting rooms. Covering nearly 2,600 square meters and a variety of configurations from 6 to 1,000 guests and a number of event possibilities from galas to a boardroom meetings. Visit hotel’s restaurants: Corniche; Grills@Chill’O restaurant and lounge, Jazz & Fizz bar, French Bakery Corner, Le Café lobby lounge. Our Gourmet Catering is top quality solution for organizing magnifique events at your place. Also visit hotel’s recreating facilities: signature SoSPA and SoFIT gym.